Everyone needs an easy chicken noodle soup recipe in their lives. Especially with the fall and winter flu and cold season bearing down on us. This soup is inspired by a chicken soup I recently ate at the iconic Silver's Restaurant in Southampton, New York. Among other things, Silver's is famous for a $65 lobster roll, yes $65. Apparently there is a whole lobster tail in the sandwich. Intrigued, but not convinced, we skipped the lobster roll and ordered the special of the day, Chicken Soup. It was love at first slurp. Silver's serve an enormous bowl (really big enough for two) that has the most interesting and fragrant broth. My friend Jean and and I put on our sleuth hats as we sat at the dining counter trying to to discern what was in the soup that made it so good. After some discussion and a lot of slurping we guessed cinnamon and ginger. Garrett, the owner of the restaurant kindly filled us in on what we were missing, a dash of nutmeg. 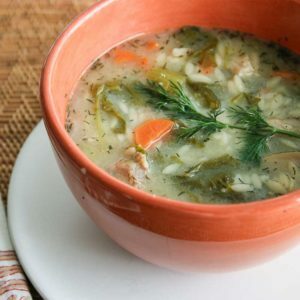 The result is a delicious and aromatic broth that will fill the bill whether you are down with the flu or just looking for an easy comforting meal. I was never a nutmeg fan until I tasted freshly grated nutmeg. Freshly grating your nutmeg makes all the difference in the world. All you need is a fine microplane to grate your nutmeg. Check out my Nutmeg post to learn more about this delicious spice. I use two kinds of ginger in this soup: fresh and powdered. I think the double dose makes it more delicious than just using one or the other. The fresh ginger slices for this soup do not need to be peeled as you will remove them before serving. Just slice the ginger and give them a little pound with the back edge of your knife to help release their flavor. I add a teaspoon or two of Worcestershire sauce to the broth to give it more umami. You can substitute Asian fish sauce if you don't have Worcestershire sauce. they are both made from sardines, an umami-rich ingredient. Read my Umami post to learn more about this scientifically proven 5th taste. My goal was to make this recipe quick and easy to prepare and not one that you spend hours making the broth. So the challenge was how to make a great soup, where the broth is the star, without doing all the work. I started with a new chicken broth I hadn't used before. I guess the marketing spoke to me. The soup might be even better with homemade broth, but then again, you couldn't make it in 30 minutes like you can with this soup. I used Zoup Chicken Broth. They advertise that their broth is "good enough to drink." I'm a sucker for good marketing so I gave it a go. Note: Zoup has not compensated me in any way for this endorsement. This easy chicken noodle soup is served with a half a chicken breast in each bowl. You could shred the breasts before you serve it, but I think the half breast in each bowl gives the soup a generous and fun presentation. The soup is simple to make and only requires one pot. I don't recommend making a ton of this soup in advance because it is the freshness that makes it so good. If you really want to make a delicious meal, accompany this easy chicken noodle soup with my version of Silver's Garlic Bread. I call it The Best Garlic Bread Sometimes the simplest preparations are truly the best. Heat a large soup pot over medium to medium high heat. When the pot is hot add 1 - 2 T of olive oil. When the oil is hot, add onion, celery, carrots and ginger slices to the pot. Saute over medium heat for about 5 minutes until soft, but not brown. Add ginger, cinnamon and nutmeg and cook another minute or two. Add chicken stock and Worcestershire sauce. Bring to a boil. Add chicken breasts and reduce heat to medium. Cook five minutes and bring briefly back to a boil. Add pasta and reduce to medium and cook for 10 more minutes or until pasta is al dente and chicken breasts are cooked through. Do not over cook or chicken will be tough and pasta will be mush. Turn off heat and taste and season with kosher salt and pepper, and if desired, additional Worcestershire sauce. Stir in chopped parsley. 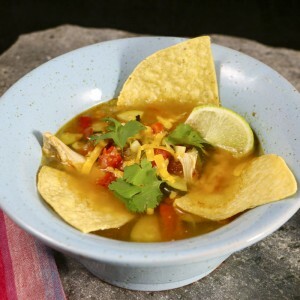 Place a chicken breast in each serving bowl and ladle in broth and veggies. My husband made this soup as part of our meal prep this week. It’s delicious!!! The aroma of this soup is reason enough to make it. Great recipe!!! I had to stop to collect my thoughts to write about Easy Chicken Soup or I’d have 4 paragraphs. One looks in the bowl and sees chicken soup, but it’s the unexpected pleasure of the spice flavors that started immediate raving by my guests. Followed with requests for the recipe (so easy to comply) & plans to cook it in the days just ahead! leave the empty pot UNWASHED just overnight and you will wake to lovely subtle aromas that hint of dining in exotic places!! Wow Kathy! I have never thought that leaving a pot unwashed would be a bonus, but this is a suggestion I can easily comply with. Thank you for the great review. Omg. Made the soup and the garlic bread. Both my husband and I had seconds. It was so great. And brought me right back to Silvers in southampton…and beyond. Silvers literally slipped away and was replaced by the flavors and scents of your soup and bread Kim … in my own homey kitchen and with my happy husband (and dogs). Thank you so much for creating this. Indeed, a beautiful gift. You are a gift. So talented. Thank you Jean! So glad you enjoyed the recipes. Thank you for introducing me to Silvers! I have a feeling they may not be around next year.